The Knowing the Bible series is a resource designed to help Bible readers better understand and apply God’s Word. These 12-week studies lead participants through books of the Bible and are made up of four basic components: (1) Reflection questions help readers engage the text at a deeper level; (2) “Gospel Glimpses” highlight the gospel of grace throughout each book; (3) “Whole-Bible Connections” show how any given passage connects to the Bible’s overarching story of redemption, culminating in Christ; and (4) “Theological Soundings” identify how historic orthodox doctrines are taught or reinforced throughout Scripture. With contributions from an array of influential pastors and church leaders, these gospel-centered studies will help Christians see and cherish the message of God’s grace on each and every page of the Bible. The Gospel of Luke is the most thorough historical account of the birth, life, death, and resurrection of Jesus Christ. But Luke’s book is more than just history; it’s also a rich source of life-giving theology, revealing Jesus’s identity as Israel’s long-awaited Messiah and the Savior of the world. 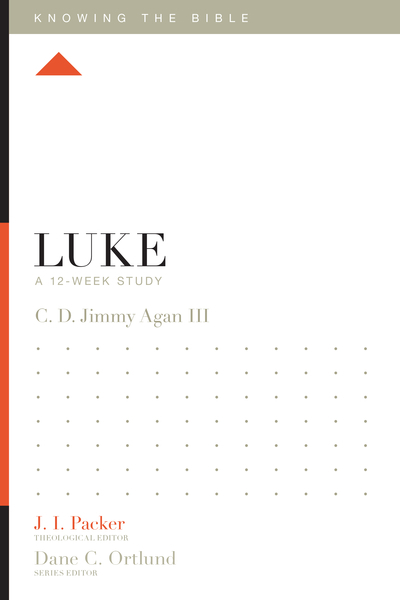 In this study, New Testament scholar Jimmy Agan III walks readers through Luke’s Gospel, helping Christians see that Jesus is not simply a great teacher but the great Savior.